Explore the 2016 Volkswagen CC! Sleek, stylish, sophisticated, and speedy, the 2016 Volkswagen CC provides drivers from West Hollywood, Beverly Hills, and Los Angeles one of the most exciting rides of the summer. Featuring a powerful engine that boasts stellar levels of fuel efficiency, the CC offers unrivaled handling. The CC also provides an abundance of interior space, striking design, and the very latest in technology. Best of all, the CC is one affordably priced car, available in a wide range of exciting trims, so you can make sure to get everything you want and nothing you don’t on your model. Read on for the details! With the CC, you have the luxury of power thanks to a standard 200-horsepower turbocharged engine. A 3.6-liter VR6 engine delivering 280 horsepower and 265 lb.-ft. of torque is also available. An available 6-speed DSG transmission with Tiptronic paddle shifters means you can take control and enjoy the drive exactly how you want. In addition to being spacious, the CC provides you with standard heated V-Tex leatherette front seats and a dual-zone automatic climate control system. Standard on the CC is the state-of-the-art MIB II touchscreen infotainment system with VW Car-Net App-Connect, featuring Apple CarPlay and Android Auto smartphone connectivity. Available features make driving a breeze, like Blind Spot Monitor, Park Pilot and Adaptive Cruise Control. One of the best things about the CC is that it delivers you luxury-quality features and craftsmanship at an attainable price. A new 2.0T Trend trim for 2016 offers even more value. If you're looking for the 2016 Volkswagen CC in Santa Monica CA, then Volkswagen Santa Monica is where you'll find it. True luxury comes in having premium-quality features, high tech infotainment and driver assistance, and a sleek design without having to pay the high price that usually comes associated with such quality. With the CC, you'll find exactly that. Although the CC had a successful 2015, there are a few changes to the model to highlight for the 2016 model year, including a new 2.0T Trend trim and two new R-Line trims. Standard features on the CC include Bi-Xenon headlights, LED taillights, a rearview camera, heated seats, Android Auto and Apple CarPlay. As you can see, amazing value can be had, and drivers who opt for one of the R-Line trims can have even more features that include available 18-inch wheels, a panoramic sunroof and leather seats. In addition to the new infotainment system featuring Android Auto and Apple CarPlay, the CC adds more available Driver Assistance features. These include Forward Collision Warning and Autonomous Emergency Braking, Adaptive Cruise Control and Lane Departure Warning. The lower level trims feature a 2.0L turbocharged engine that produces 200 hp and 21 mpg city** and 32 mpg highway**, according to EPA estimates. Upper-level trims are outfitted with a powerful 3.6L V6 engine that can pound out an impressive 280 hp while also achieving 17 mpg city** and 25 mpg highway**, based on EPA estimates. Meanwhile, the CC boasts a range of driver assist programs and devices, like Tiptronic paddle shifters, an optional six-speed DSG transmission system, a sport-tuned suspension, and an optional leather-wrapped steering wheel. A 6.33-inch color display touchscreen sound system allows you to select your music with the simple swipe of a finger. A VW Car-Net App-Connect system makes it possible for you to plug your smartphone directly into the vehicle, enabling you to access your own music, apps, maps, and much more. A 6.33-inch color display navigation system lets you hunt out destination information, generate route maps, and even locate the nearest gas station while you're on the road. As with anything luxurious, the best way to appreciate the CC is by simply getting behind the wheel. Comfortable front seat legroom and seating materials help you enjoy even the longest of drives, while affordable prices help ensure your wallet enjoys it too. If you're ready to get behind the wheel with a test drive of the 2016 Volkswagen CC in Santa Monica CA, simply fill out the form to get started. You can also contact us directly or stop by the dealership to see the CC's sleek and sophisticated design for yourself. Located at 2440 Santa Monica Blvd. in Santa Monica, we welcome you for a test drive any time. You may also contact us online or by phone at 855-459-7323. 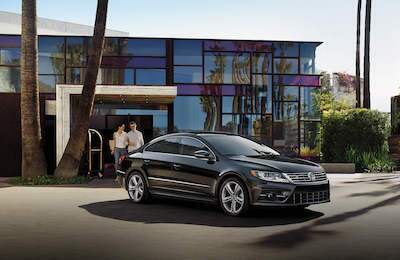 Don't wait to experience all that the 2016 Volkswagen CC has to offer you: visit Volkswagen Santa Monica today! *Prices exclude transportation, taxes, title, other options and dealer charges. Dealer sets actual price. **EPA estimates. Your mileage will vary and depends on several factors, including your driving habits and vehicle condition.